It looks like as we inch closer to the Galaxy S10 launch scheduled to take place on February 20, more leaks will come forth. Only recently, press renders of all three models were leaked, showing the size comparison and the number of cameras each model would have. The new leak, however, not just reveals how different the Galaxy S10 is going to be from its predecessor, but how users will be able to use the upcoming flagship for cryptocurrency-related purposes. The design of the Galaxy S10 is the same as revealed in previous leaks. 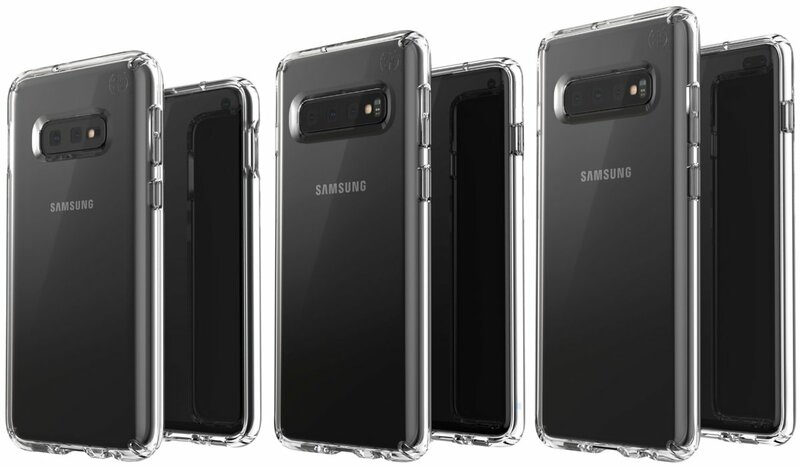 With slimmer bezels at the top and bottom, along with a punch-in hole selfie camera, the Galaxy S10 is going to be aesthetically different than the Galaxy S9. 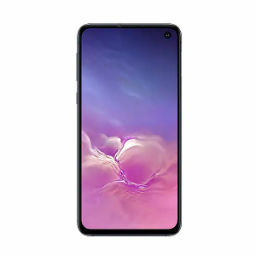 From the look of things, this particular model could be the Galaxy S10E, the most affordable variant in the entire upcoming lineup. 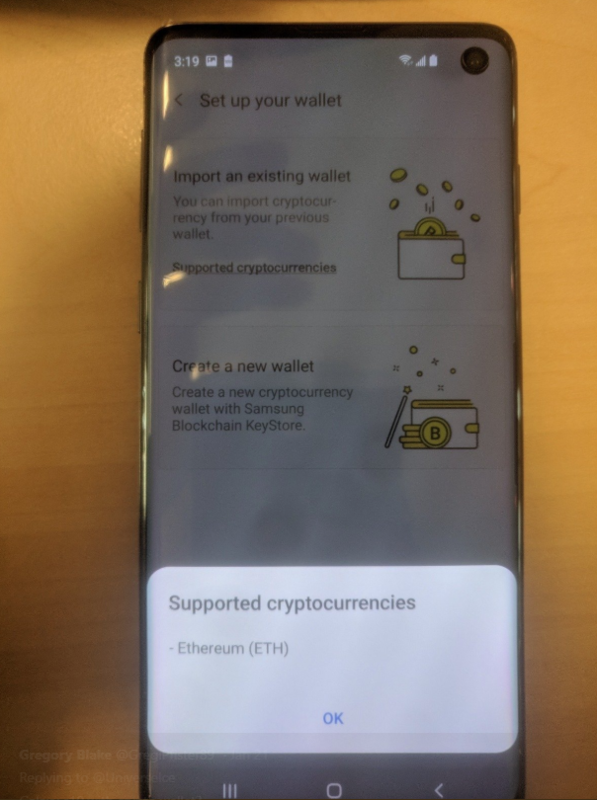 While we’re confident that this model will a capable one, Samsung’s potential foray into Blockchain is quite interesting. However, a while back, Samsung reported it would develop chips specifically made for mining purposes. 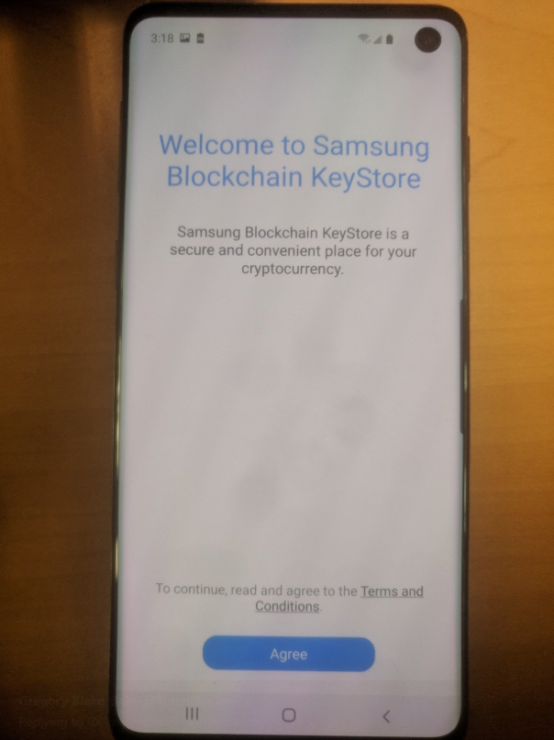 While the company did not specify if the processor would be made for desktops or mobile devices, the Samsung Blockchain KeyStore provides some evidence that Samsung could be focusing on smartphones for now. As you can see in the second image, the supported cryptocurrency is Ethereum (ETH) but there’s no telling if more currencies will be added in the future. Samsung has been using ARM’s Mali GPUs in smartphones for as long as we can remember, but a job opening spotted back in 2017 revealed the Korean giant might want to make its own graphics processors for better integration with the software. 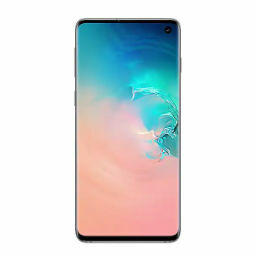 Of course, reports have said that the Galaxy S10 will not be the first smartphone family to get Samsung’s in-house GPUs, but perhaps we can put our faith in the successor. Apart from the Galaxy S10 lineup unveiling, Samsung will also announce its foldable smartphone on February along with the release date and pricing details. More information according to a previous leak suggests that only the Galaxy S10 and Galaxy S10 Plus will sport an in-screen fingerprint reader, while the Galaxy S10E will have the regular scanner. While this is all the info we have for you, don’t be surprised if more leaks come through. After all, February 20 is less than a month and we’ll have loads of news for you in the future.